Although much reduced compared to its largest extension, the tramsystem of Lisbon is still one of the most interesting and exciting of the world. 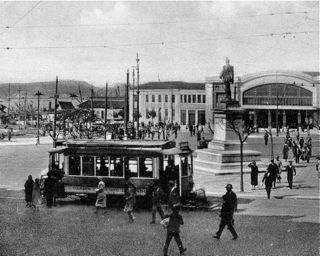 The objectives of this site are to make better known the Lisbon tram and its history. 1873 November 17th: Opening of the first mule tramline from Santa Apolónia to Santos. Operation was on Standard gauge: 1435 mm. 1884 April 19th: Opening of the first street funicular (Lavra). 1890 August 14th: Opening of the first cable tramline (Estrela). 900 mm gauge. 1894: Decision to convert the mule tramsystem to 900 mm gauge. 1900 May: Conversion of the network to 900 mm gauge completed. 1901 August 31st: Opening of the first electric line from Cais do Sodré to Algés. 1902 August 10th: Withdrawel of the last mule trams. 1913 July 3rd: Closure of the last cable tramline. 1959 December: Opening of the first Metro line. 1960: Start shrinking of the tram network. 1995 March: Introduction of modern articulated, low floor tramcars.